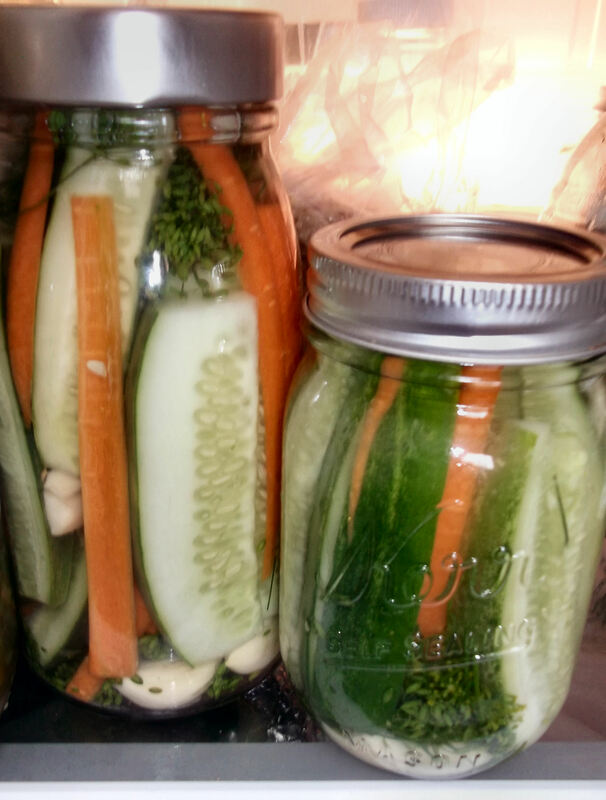 I had just gotten home from the farmers’ market with a big bag of small pickling cucumbers when I saw this recipe posted by a local food blogger. Pickles that didn’t require any cooking? Not even a water bath for canning? I’m all over that. Especially on a hot and humid summer evening. This recipe-that-isn’t-quite-a-recipe is unique in that you can adapt it for as many cucumbers—or as many clean jars of any size—you have. And for as much garlic and dill as you prefer. 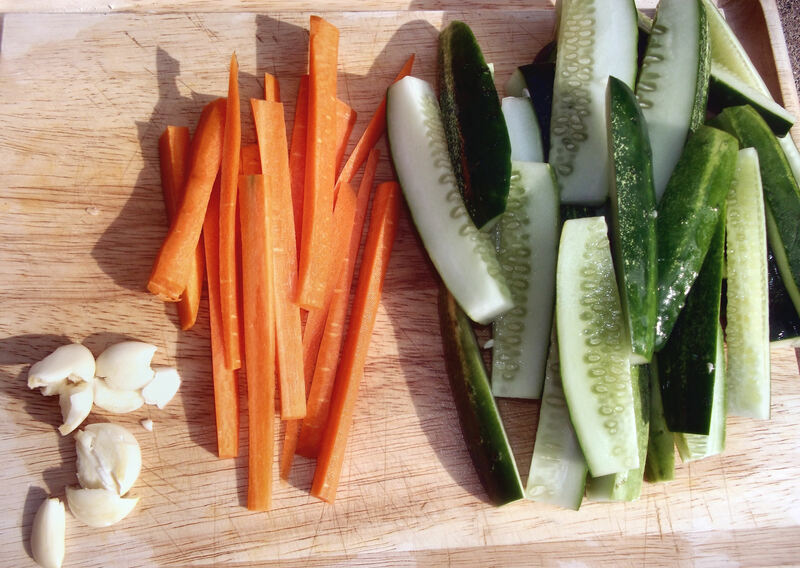 Start by slicing the cucumbers into spears, the carrots into thinner spears, and peeling and smashing the garlic so it breaks apart a bit. 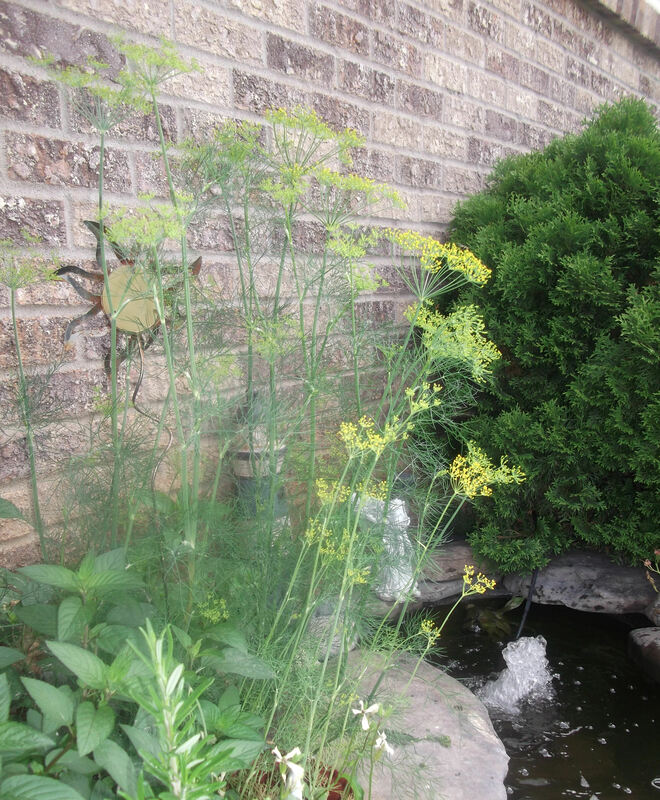 And get lots of fresh dill ready. 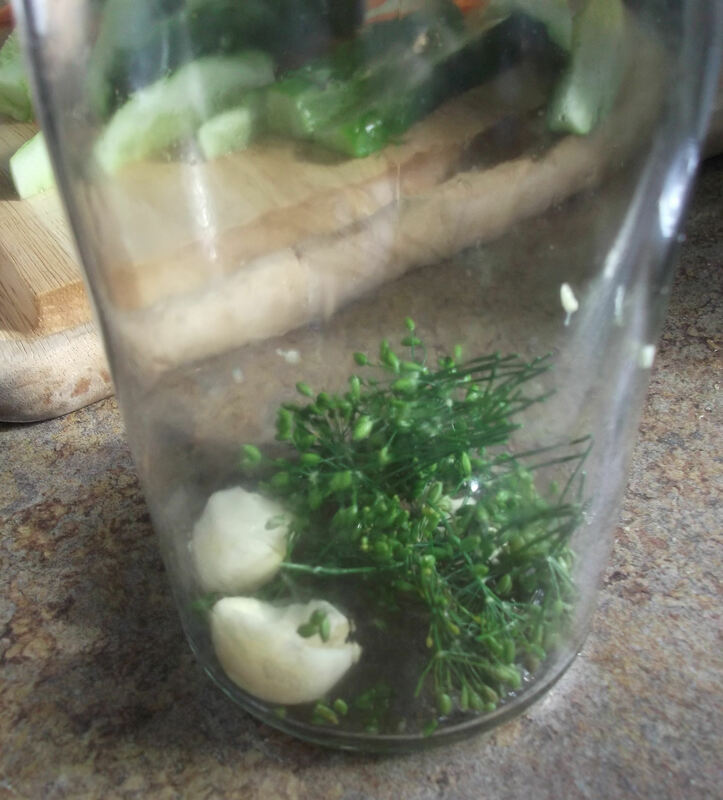 Place a clove or two of garlic along with some dill in the bottom of a clean jar. 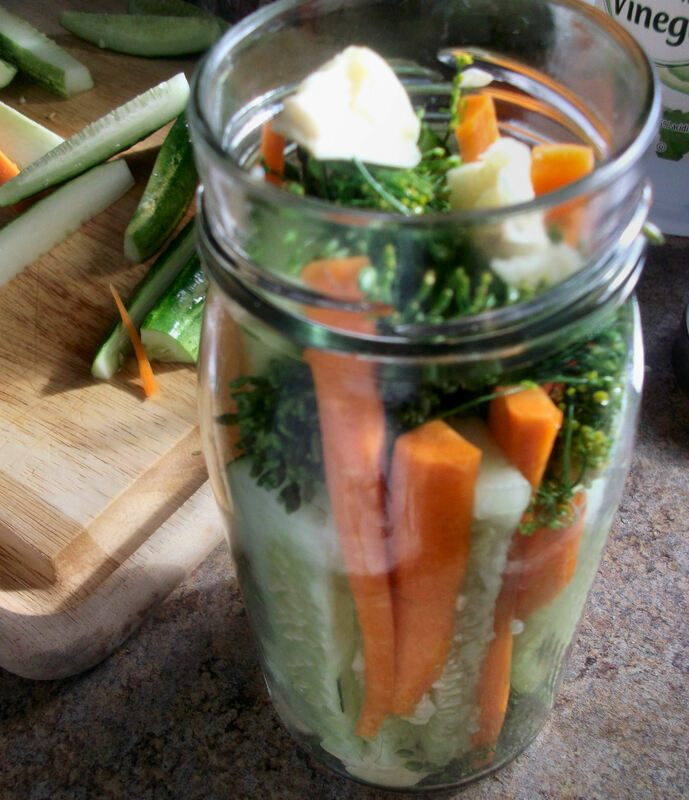 Pack the jar with the cucumber and carrot spears (holding the jar at an angle makes this step a little easier). 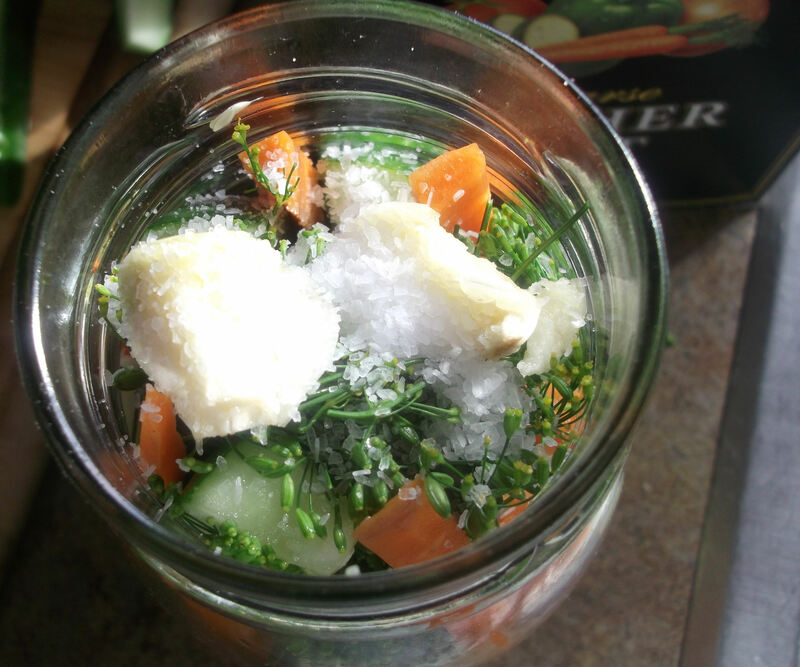 Pack the jar until nothing more fits, and then press in another clove or two of garlic and some more dill on top. Sprinkle the top with Kosher salt. The amount of salt—and dill and garlic, as well—will depend on how you like your pickles. I used a pint jar and about ½ t of salt or so. Slowly add the white vinegar into the jar until it’s about ¾ full, then fill the rest of the jar with filtered water (I just used the water dispenser from the fridge), leaving about ½ inch at the top. Screw on the lid and gently shake to combine. Place the jar in the refrigerator for several hours or overnight. Because everything was kept cold, these pickles are extra crunchy! The pickles will be ready within a few hours, but waiting at least a day yields the best flavor and gives the carrots a little longer to become pickled. Enjoy!